I finally got my hands on (and head under) a Nutcase Simi Mini Dots Helmet! Another victory for truth in labelling. And taking pictures in your pyjamas. I've wanted a higher visibility helmet for use with the slightly too understated black Pashley for quite some time. I've also wanted to experience a less 'sporty' style helmet. (Unless you count looking like a deranged gymkhana escapee as sporty.) Not to mention the convenience of having a helmet with each bicycle now that they are stored in two separate locations. Then there's the most important variable: The fact that a red and white polkadot helmet is as cute as a mutant ladybug's behind! After focussing my consumer lust on this particular helmet I was pleased to discover Ruthy's Rides as an online Australian distributor of Nutcase. Then I was extra pleased to discover they were having a sale on the latest models. I dutifully measured my head and placed my order just before Christmas. The Nutcase also came with a green bracelet proclaiming 'I Love My Brain' and the usual foam inserts for custom fit, also screaming 'I LOVE MY BRAIN'. It was strange to me how much the packaging seemed intent on making me feel smug about my mostly utilitarian purchase until I remembered that it comes from a country where helmets are not compulsory. I haven't had a chance to ride with it yet but superficially I'm pretty impressed with the quality of the Nutcase. It's very light, it will definitely make me more visible with colour and reflective elements, the magnetic buckle is a revelation worth the cost (No danger of pinching your neck!). Even the foam inserts seem more luxurious than the ones in my cheaper helmet. The visor easily clips on and off for the fickle amongst us and it also features the same back of the head 'turn to tighten' device as my other helmet (a boon for a fast, secure fit). I'll be interested to find out just how much hotter this style of helmet turns out to be, if at all. The large ventilation holes are numerous and the whole thing is surprisingly weightless but it's high summer here in Tasmania and the country-wide heatwave has even made it to our little island so it will soon have a trial by fire. This nutcase will report back on that Nutcase in due time. Thanks for this review.I purchased a 1st generation Nutcase about 5 years ago.The thing weighs a tonne! I can really only wear it on my upright shopper as it takes too much effort to hold my head up on the 'fixie'. I'm glad they've improved the design. 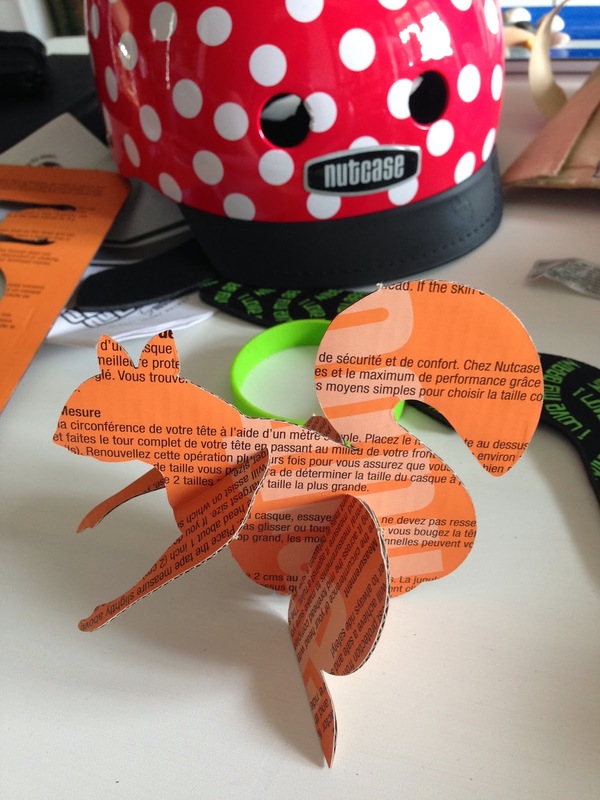 (love the squirrel,too,BTW) Happy cycling . It's definitely not as heavy as any other full helmet I've seen. I'll be testing it out on-bike tomorrow!